Used as a short form for capital expenditure, capex refers to all the assets and other tangible or intangible factors that are used by a business organization to generate revenue. Capital expenditures are incurred to increase the capacity of the company to create wealth. Some of the investments incurred through capital expenditure include the purchase of machinery, equipment, properties or upgrade of the current apparatus. It is important to highlight that all assets bought under capital expenditure depreciate with time. Opex stands for operating expenditures, which refers to the expenses incurred by the organization in the process of maintenance and running the assets that generate revenue in the organization. Additionally, all the costs incurred in the daily running of the organization such as administration costs and research and design costs are recorded as operating expenses in the books of account. The earnings before interests are realized after deducting operating expenses from the operating revenue figures. Capital expenditure is a term that is used to describe the costs incurred by the organization when buying assets that will help in generating revenue for the organization in future. Capital expenditure can also be incurred when an organization chooses to incur costs in the process of repairing or adding value to the existing assets to extend their lifespan. Operating expenses refers to the costs incurred by the organization in the daily running of the enterprise which may include administrative costs and other costs that helps the entity to accomplish its goals and objectives. Capital expenditure involves enormous prices because they are engaged in buying fixed assets like machines which are usually expensive. Although capital expenditures are very massive, they are incurred only once in the lifespan of the organization. For example, an organization will buy a stone crusher that will be used for the entire life of the organization and can only be replaced if it is deemed as not sufficient to support the objectives of the organization. On the other hand, operating expenses involve recurring costs, which are incurred so often to ensure that the entity runs smoothly in the process of earning revenue. 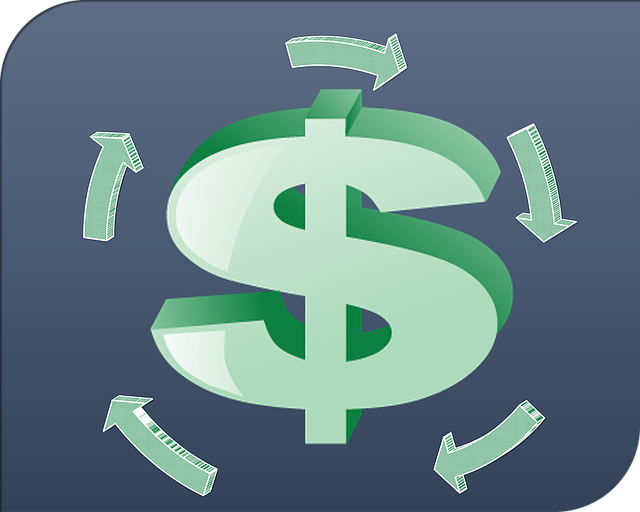 Operating expenses have to be paid to ensure that organizations run on a daily basis. In bookkeeping and preparation of financial statements, costs incurred through capital expenditures are not deducted in the period they were incurred. Tangible assets are depreciated, and intangible assets are amortized over time, which means that the cost is spread out in different financial periods. Costs incurred when catering for operating expenditures are entirely deducted in the period they were incurred because they were used to cater for expenses of that accounting period. They cannot be transferred into the next financial period. Profits earned when a capital expenditure has been incurred occur in a slow and gradual process because the machinery will be operated by the organization for an extended period. Although the profits earned by the organization after a capital expenditure are slow and gradual, they end up being more after accumulating after a lengthy period. Incomes earned by costs incurred through operating expenses are achieved within a shorter period. Profits made using operating expenditure can be huge but are earned once unlike in capital expenditure where benefits are gradual. Some of the typical examples of capital expenditures include buying machinery and equipment, acquiring intellectual properties assets like patents, purchase of land, and costs involved in building organizational premises. Some of the costs associated with operating expenses include wages, maintenance and repair of machinery, utilities like water and electricity bills, rent, administrative fees, and research and design costs. To fund both capital expenditure and operating expenditure, the organization has to source finances. Financing capital expenditures require large sums of money which means the management of the organization may end up borrowing from lending institutions. Lending institutions like banks offer long-term loans which help the entity to incur capital expenditure like buying a parcel of land or machinery upon which the loan will be repaid for an agreed period mostly more than ten years. On the other hand, organizations source funds to cater for operating expenses from the profits earned by the organization or from individual investments. Finances used to cater for operating expenses are not very high despite being regularly incurred. Owners of the company can cater for such costs from individual savings and soft loans which are paid within a short period or sourcing from friends and family members. Capex stands for capital expenditure which are costs used in buying tangible and intangible assets that will help in creating revenue for the organization. Operating expenditures are costs incurred in the business to cater for the daily running of the entity. Some of the examples of capital expenses include buying land, building premises, buying equipment and machinery while some of the examples of operating expenses include utilities, rent, and administrative costs among others. In addition, capital expenditures are not recorded and deducted in the books of accounts in the period they were incurred but are depreciated and amortized over several accounting periods while operating expenses are deducted in the period they were committed. Other differences between capital expenditure and operating expenditures include accounting treatments, sources of financing, and profits earned among others. Jecinta Morgan. 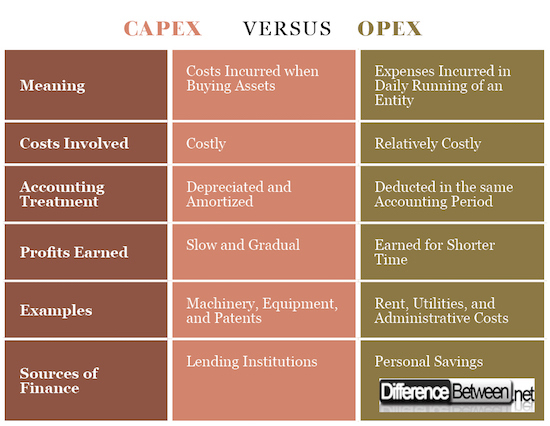 "Difference Between Capex and Opex ." DifferenceBetween.net. March 20, 2018 < http://www.differencebetween.net/business/difference-between-capex-and-opex/ >. Appuhami, BA Ranjith. "The impact of firms' capital expenditure on working capital management: An empirical study across industries in Thailand." International Management Review 4.1 (2008): 8. Chen, Sheng-Syan, and Kim Wai Ho. "Market response to product-strategy and capital-expenditure announcements in Singapore: Investment opportunities and free cash flow." Financial Management (1997): 82-88. Verbrugge, Sofie, et al. "Methodology and input availability parameters for calculating OpEx and CapEx costs for realistic network scenarios." Journal of Optical Networking 5.6 (2006): 509-520.